India’s own “two front” doctrine could prove just as dangerous as Germany’s in WWI. Recent commentary on the outbreak of the First World War has highlighted the link between the political and military spheres, in which military mobilization timetables exercised a negative influence over the political positions of governments. Interestingly, there are echoes of the same phenomenon in South Asia today. Moreover, India’s “two front” problem is similar to the problem faced by Germany when it felt the need to first defeat France, before turning its attention to the slower and more removed mobilization of Russia. Could the dangers of South Asia today be echoes of those a century ago? First, consider the issue of mobilization schedules. With Serbia and Austria-Hungary squaring off, their respective allies, Russia and Germany, went into a competitive mobilization that culminated in the outbreak of war. South Asia is presently experiencing some aspects of this narrative. India is today looking to review its conventional doctrine adopted a decade ago. The doctrine called for swift mobilization in order to be able to react to terrorist threats from Pakistan, as in the case of the attack on Parliament in December 2002. On that occasion, India was not able to respond swiftly – its strike corps took three weeks to get into position. So India chose to go in for coercive diplomacy rather than attacking Pakistan militarily. The latter would have proven costly and there was also the nuclear threat to consider. This led to the “cold start” doctrine, in which India shifted its reliance from strike corps to smaller, swifter formations closer to the border that could react quickly. A critique of this doctrinal innovation was that it reduced the time window for crisis diplomacy, a harkening back to the Guns of August, which expertly describes the political-military gap leading to the Great War. The problem, as it was a hundred years ago, remains the military’s interest in full preparedness. 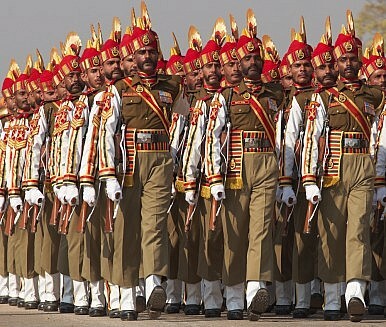 For instance, if India was to launch a portion of its combat-ready integrated battle groups into Pakistan in response to a terror attack, they could face a piecemeal response from Pakistan’s army. For that reason, the troops cannot be sent across the line of control in isolation, but would require at least partial mobilization from the rear so as to either deter or respond to Pakistan’s military counter. In light of this mobilization, the Pakistanis, uncertain as to India’s intent, would likely race to follow suit, leading to a national mobilization of both sides quite in the tradition of the First World War. During the Kargil War, though it remained localized, the Indian army partially mobilized and kept a portion of its troops at the border elsewhere, in a defensive position. Even as these two militaries theoretically make their moves, diplomacy would be underway. In light of the nuclear backdrop, international pressure would be considerable. Some of the moves by both countries would be directed at the international community, in order to pressure the other side to either slow down or back off. Thus, in the initial period, the contest would be between the two diplomatic-military strategies. While the new dimension, the nuclear component, could be expected to bring about a different outcome from that in the summer of 1914, the feature of “saving face” that existed then may continue to complicate matters now. During the Kargil War, the distinction in Pakistan between its civilian government and the military enabled the civilian government to wash its hands of the military’s actions. Prime Minister Nawaz Sharif went across to Washington to organize a de-escalation. In 2002, the U.S. presence in the region was great enough to prevail upon General Pervez Musharraf to do an about turn with his January 12 speech, in which he promised a crackdown on extremists. These fortuitous circumstances may not exist in future. Therefore, there is a case for South Asia to move beyond conditions reminiscent of Europe a century ago. The second issue is the one in which India may perceive itself to be in Germany’s “two front” situation. In the First World War Germany had the Schlieffen Plan, designed to knock out France. India’s strategic writing talks of “a collusive threat.” On its Chinese front, mobilization schedules play a role in that China’s infrastructure building in Tibet has prompted India to change from a defensive strategy to one of active deterrence. Over the past half-decade, India has given itself the wherewithal to cope with both fronts. Its three strike corps have been deemed effective on the Pakistan front. It can now square off defensively while also having a countervailing capability in the form of a mountain strike corps on its China front. Given that operations are slower in the mountains, the possibility of India first achieving victory on its western front and then turning its attention to the east is a possibility. Alternatively, since China is a stronger opponent, India may hold on the western front and put its weight into warding off China. India’s ability to counter Pakistan was found wanting in the aftermath of the 2008 Mumbai attacks. Some of the $350 million in military spending that India has recently approved is for equipping itself for these alternatives. It is likely therefore that by importing more than three times the amount of Chinese and Pakistani arms (which are the next two largest importers), combined with these additional monies, enable both alternatives. This is yet again reminiscent of the arms race of a hundred years ago that preceded and enabled the muscle flexing of 1914. The difference this time is nuclear weapons. Their presence should imply that aggressive strategic doctrines do not coexist with offensive military doctrines. That, however, is apparently not the case in South Asia. The region’s militaries are still in the modern age. The might be cognizant of the revolution in military affairs and the nuclear age, but so far at least they have been only partially responsive to it. Ali Ahmed, PhD is author of India’s Doctrine Puzzle: Limiting War in South Asia (Routledge 2014). He blogs at http://www.ali-writings.blogspot.in/.